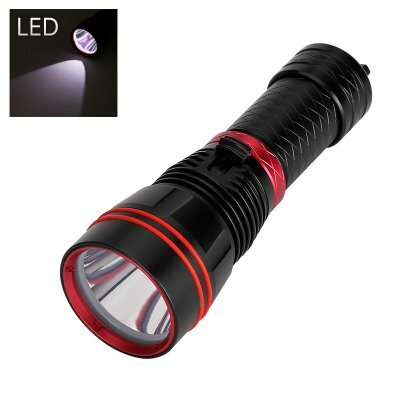 Successfully Added CREE XML L2 LED Flashlight - For Outdoor Activities, 2000 Lumens, Durable Aluminum Alloy Design, 100000 Hours Lifespan to your Shopping Cart. With this Outdoor CREE flashlight you can leave after dark with confidence. This high powered 2000 lumens flashlight is light in weight and extremely portable – the perfect outdoor companion that can accompany you anywhere you go. Whether you go out for a hike, camping trip, or simply need a backup light during an electricity failure, this CREE flashlight is the perfect gadget that will provided you with the needed light in the darkness. This powerful CREE LED torch is made from a durable aluminum alloy and its rechargeable batteries come with a battery life up to three hours before needing recharging. The LED itself has a life spawn of up to 100,000 hours meaning that, with this Outdoor flashlight, you do not have to worry about running out of light anytime soon. A perfect torch to carry around on hikes, during outdoor activities, to illuminating camp grounds, or to keep at home in case of emergency situations – this CREE flashlight is guaranteed to light up you way for years to come. This product comes with a detachable wrist strap to ensure that you will no longer have to worry about dropping or losing your torch while out in the wild. Arabic: - مصباح LED كري - Chinese Simplified: - CREE LED 手电筒 - Czech: - CREE LED svítilna - Dutch: - CREE LED zaklamp - French: - CREE LED Flashlight - German: - CREE LED-Taschenlampe - Hebrew: - פנס LED הקרי - Hindi: - क्री एलईडी टॉर्च - Hungarian: - CREE LED zseblámpa - Italian: - CREE LED torcia - Japanese: - クリー LED 懐中電灯 - Korean: - 크리 어 LED 손전등 - Malay: - Lampu suluh LED CREE - Norwegian Bokmål: - CREE LED lommelykt - Romanian: - Lanterna LED CREE - Russian: - КРИ Светодиодный фонарик - Spanish: - CREE LED linterna - Thai: - ไฟฉาย LED CREE - Turkish: - CREE LED el feneri - Vietnamese: - Đèn LED CREE.